Congratulations go to Professor Chia Feng Juang, an Associate Editor of AJC, who is honored as IEEE Fellow, the highest grade of membership of the IEEE, for his outstanding contributions to data-driven fuzzy systems. It is heartbreaking to learn this sad news, that is, one of our best friends, also an Editor-at-Large of AJC, Prof. Roberto Tempo passed away on January 14, 2017. Prof. Roberto Tempo is truly a great scholar, a mentor, and a real friend to all of us. He is a giant in the international control community, and his being pass-away is surely an enormous loss to the community. Our deep condolence to his family and may he rest in the peace. Congratulations go to Professor Daniel Ho, an Associate Editor of AJC, who is honored as IEEE Fellow, the highest grade of membership of the IEEE, for his outstanding contributions to stability and control for stochastic systems. 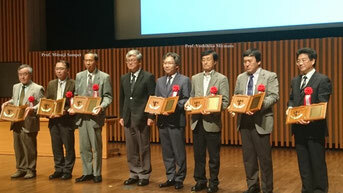 Congratulations go to Professor Yoshihiko Miyasato (3rd from the right), an Associate Editor of AJC, who is honored with the SICE Fellow Award. And Professor Mitsuji Sampei (2nd from the left), a former Associate Editor of AJC, who is honored with the SICE Fellow Award. 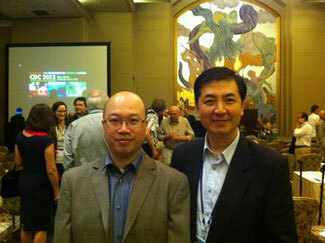 of the IEEE, for his outstanding contributions to networked control and complex networks, effective from January 2014. Congratulations go to Professor Murray, an Editor of AJC, who is elected to the National Academy of Engineering (NAE) for his contributions in control theory and networked control systems with applications to aerospace engineering, robotics, and autonomy. Congratulations go to Professor Jinhu Lu, an Associate Editor of AJC, who is honored as IEEE Fellow, the highest grade of membership of the IEEE, for his contributions to complex networks and nonlinear circuits and systems. Congratulations go to Professor Lam who is a newly elected 2012 IEEE Fellow for his contributions to analysis and synthesis of control systems.